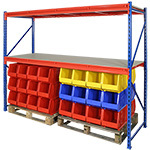 Longspan racking & shelving is used to store bulky or long items of up to 780kg per shelf level as standard, as the racking uprights can be between 1.2m and 3m apart. Longspan has chipboard shelves which locate in the shelf beams, alternatively, if moisture is present and you cannot use wood based products, you can use galvanised steel shelf panels that sit on top of the shelf beams. 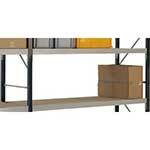 Wooden chipboard shelves provide greater strength and are able to provide higher weight capacities. 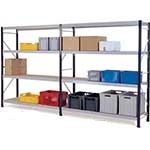 Commonly used in warehouses and anywhere where heavy duty large storage area shelving is required, it is ideal for storing large bulky items on multiple deck shelf levels. 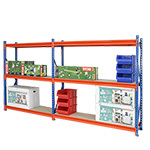 Longspan shelving is simple to install and highly adjustable with slotted uprights that can hold shelf levels at any required height. 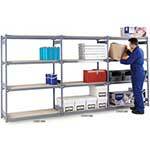 By using starter and extension bays, long runs of longspan shelving can be easily formed. All of the shelving units with chipboard shelves use FSC certified chipboard wood that is sourced from responsibly managed forests. 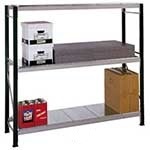 For smaller area storage requirements, we also have a range of shortspan shelving units, which are great for storerooms. 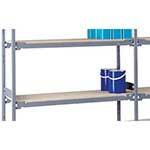 Like longspan shelving this also has steel uprights with chipboard shelves but the shelves are much narrower. 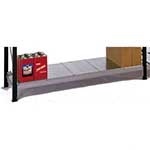 Longspan or widespan racks are 380mm - 1220mm deep with clear entry between uprights of up to 2.4m (wider available on request).